Cosmetic Junction is a bath & body label based in Salem in Tamil Nadu, that makes soaps, lip balms, scrubs, and body lotions, using natural & chemical-free ingredients. 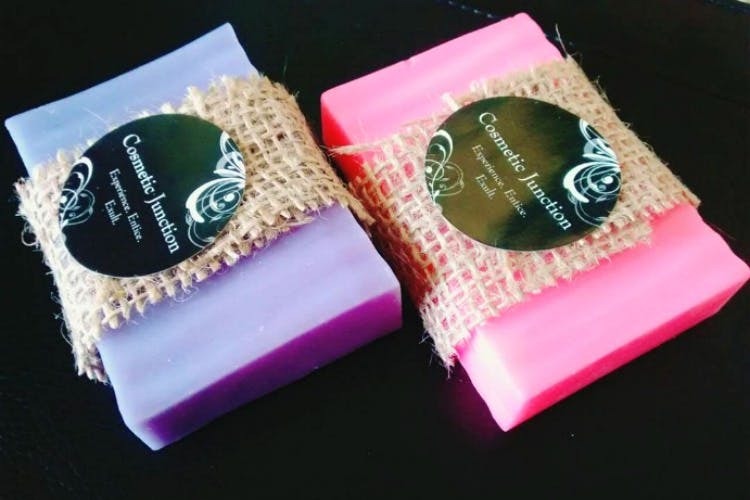 If you suffer from first-world problems, like having to bathe with boring commercial soaps, these exotic soaps by Commercial Junction will save you. Jokes aside, these soaps are seriously delicious. Made using natural ingredients, you’ll find many variants of soap bars such as Green Tea & Goat Milk, Orange-Calendula & Shea, Mogra Honey, and Charcoal & Oats! The specks of nutmeg, ground coffee, and rose petals in the soaps make them seem almost like an accessory aside from a utility product. Depending on the type of skin you have, take your pick from their many soaps. Choose a soap with shea and goat’s milk if you have dry skin, charcoal and French pink clay, lemon and mint for oilier skin types. You’ll be spoilt for choice, they have so much variety. Aside from soaps, you can check out their body butters, scrubs, lip balms, and other products too. Where: Shop online here. You can check out and enquire about their products on Instagram.